For a busy studio to efficiently manage multiple projects running at the same time, easy visibility of on-going work is business-critical. 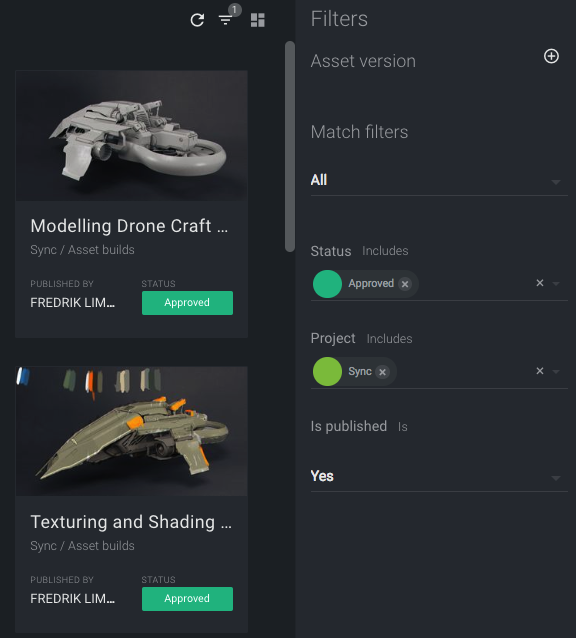 By creating a cross-project view, supervisors are able to get a birds-eye perspective of tasks, asset versions, or any other data across projects based on the object type chosen. Cross-project views can easily be tailored to your needs. You can select which attributes to include, the layout of the data and also the sort order of the data displayed. When you need to run additional queries or connect to an external tool or script you are able to hook up the cross-project view with an Action. 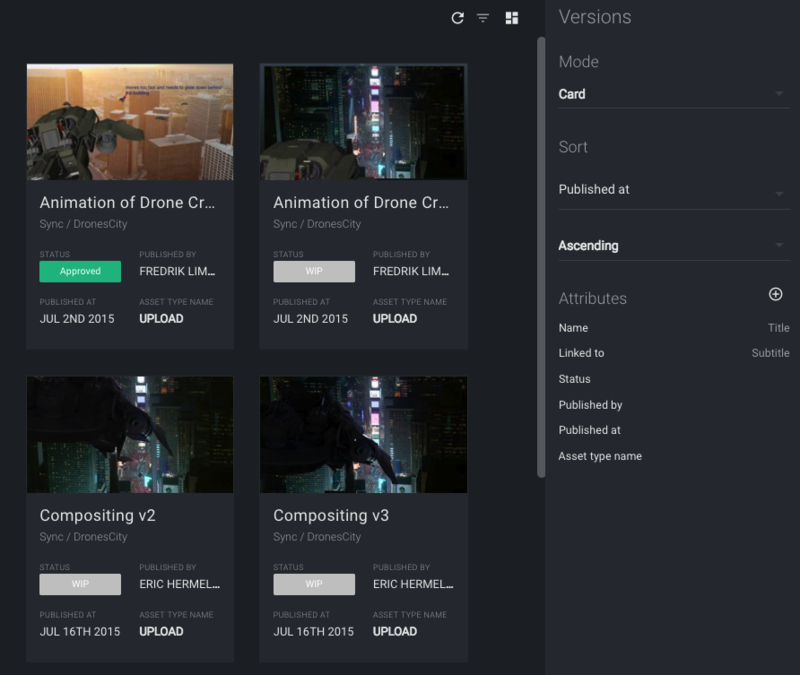 To put simply, this is how you can create the most efficient view for your projects. Navigate to the Overview page and look to the left under Dashboards. To get started with your new view, click + Create dashboard and select the object type to base the view on. You also need to choose a name for your new view but this can be changed later. Upon saving these settings, the view will display the data available across your projects. Tip: clicking the name of a card item or double clicking an item in the list layout will open the sidebar for that item. Tip: you can select multiple items on a dashboard by holding down the Shift key while selecting items. You can change dashboard-specific settings from the settings pane that is found in the top right corner. There are two options for how to display the data: card layout and list layout. This setting can also be changed from the top left of the dashboard. From the settings pane you can select which attribute to sort by and whether it should be in an ascending or descending order. When in the list layout you can also sort using the list heading by clicking the desired attribute name. The set of attributes displayed on the dashboard can be configured under the Attributes section. You can add an attribute by first clicking the plus sign and then selecting the attribute in the list. Please note that some attributes are organized into groups at the bottom. The order in which the attributes appear on the dashboard can be changed by clicking the up and down arrows. Alternatively when in the list layout, you can also drag and drop the columns to reorder them. An attribute can be removed from the dashboard by clicking the remove icon. As you may be familiar by using the Tasks and Versions pages on a project inside ftrack, you are able to save changes to a view to quickly get back to the same state later or easily switch between different view configurations. When you are satisfied with the view, click the Save dashboard button at the bottom of the settings pane. Note: filters added to the view will be saved into the dashboard. 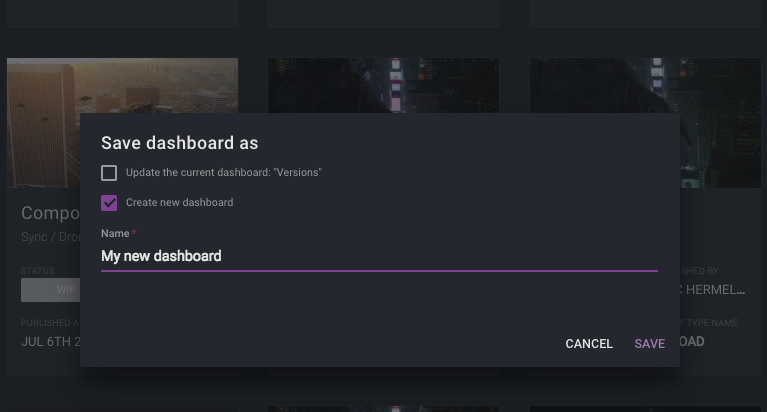 You can simply change the name of a dashboard by clicking the settings wheel next to the name of the dashboard in the left menu when hovering over it. Just enter a new name and hit Save. From the same dialog you can also delete the dashboard. Filters enable you to gain insights into your tasks, asset versions, and other data in a simple and intuitive way. You can combine multiple filters and choose if any or all of them should match. Adding a new filter or changing an active filter will automatically refresh the dashboard. The filters pane can be opened from the top right corner of the dashboard. You can add a filter by clicking the plus sign in the top of the filter pane and selecting it in the list. Note: some attributes are organized into groups at the bottom. When hovering over each filter with the mouse cursor, some filter settings will appear next to the filter name. A filter can be removed by clicking the remove icon, and toggled between active and inactive by clicking the pause icon. The scope of a filter can be changed by selecting a new operator value in the drop down. Common values are “is”, “is not”, “includes”, “does not include”, etc.